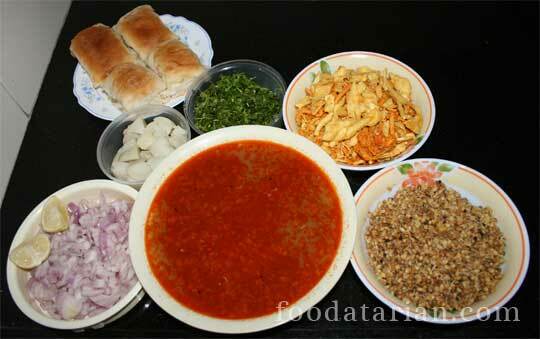 Misal Pav is traditional prepared in the central Indian state of Maharashtra. ‘Misal’ literally means a mixture. The dish is a mixture of spicy curry prepared of ‘matki’ or ‘moth beans’, boiled potatoes, onions, fresh coriander and ‘farsan’, which is another mixture of ‘Indian Savory snacks’ like sev, gathiya, peanuts, mathri, boondi, etc. While ‘Kolhapuri misal’ is the spiciest of all, ‘Puneri misal’ is milder and may be little sweet at some places. 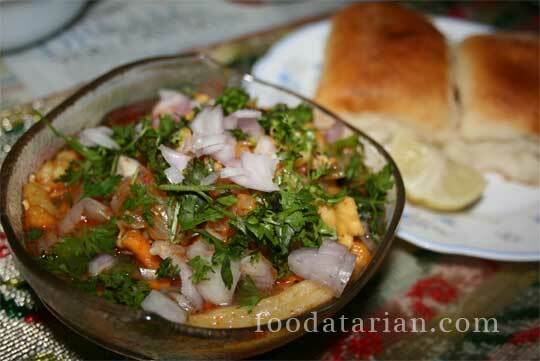 Misal is served with pav or buns. Drain the water from the soaked matki(moth beans)and leave them to sprout for another 5-6 hours. Once sprouted, remove and wash them. In a pan, heat some oil, add mustard seeds and when they splutter add some heeng(asafoetida), curry leaves, turmeric powder and red chili powder. Add sprouted beans and some water. When they are soft, add goda masala/garam masala, jaggery/sugar and salt. Stir well and cook for some time. In another pan, heat around 1/4 cup oil. Add mustard seeds. As they splutter, add heeng(asafoetida), turmeric powder and red chili powder. Add chopped onions. When they turn transparent, add 2 cups water. Cover and cook till it boils. Remove the lid, add goda masala/garam masala, tamarind pulp, salt and and mix. Bring it to a boil. In a bowl, spread some usal. Arrange farsaan on top. Pour some rassa/kat(spicy curry) and garnish with coriander leaves, chopped onions, farsaan and sev. Serve immediately with pav or bread. Maharashtrians call the above curry ‘Usal’. This curry can be a mixture of two or more sprouted beans such as green chickpeas, black eyed beans etc. Rassa/Kat is used to spice up the Misal, you can avoid it in your recipe if you do not eat spicy food, also reduce the quantity of red chilli powder used in the ‘usal’. ‘Usal’ (with a thick gravy) is also eaten with chapatis in Maharashtrian households.